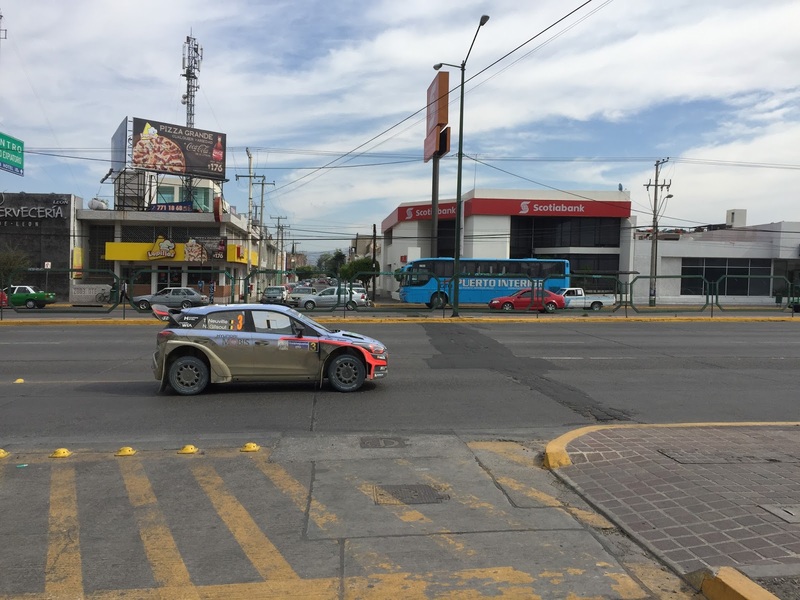 Early in March 2016 I had the opportunity to travel down to Léon, Guanajuato - a 440 year old Mexican city full of 1.6 million people - for the only North American round of the World Rally Championship. 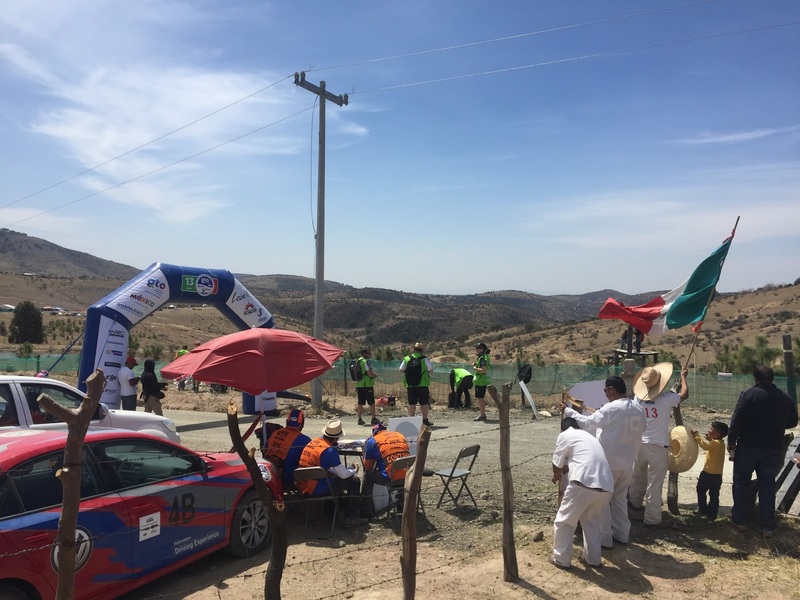 WRC Rally México, as it's officially known, is the first gravel round and the 3rd rally in the WRC season and has been for the past 13 years. I was there for my day job as engineering support for a spec powertrain component to all WRC teams, but wouldn't miss out on reporting the experience via DT - sit back, crack open a Negra Modelo, and enjoy - arriba! I wouldn't call myself Indiana CFlo or anything, but I've done a fair bit of traveling around Europe and North America in my time. I've never been as far south into Mexico until this trip, however. Léon is up on a plain at 5,955 ft elevation (1,815m) and surrounded by some picturesque high desert mountain ranges. There is a lot of modern infrastructure - my hotel was a super clean and nicely appointed Hampton Inn - but that is superimposed with crumbling sidewalks, rancheros burning trash fires, and cut-rate leather goods shopping districts full of totally not fake or copied designer shoes and handbags. Upon arriving I was greeted with the sight above: a Hyundai WRC car rolling down Léon's main drag. Despite how odd it might seem this is totally normal since the cars have to be driven between the main service area and the stages, and from the end of one stage to the other. 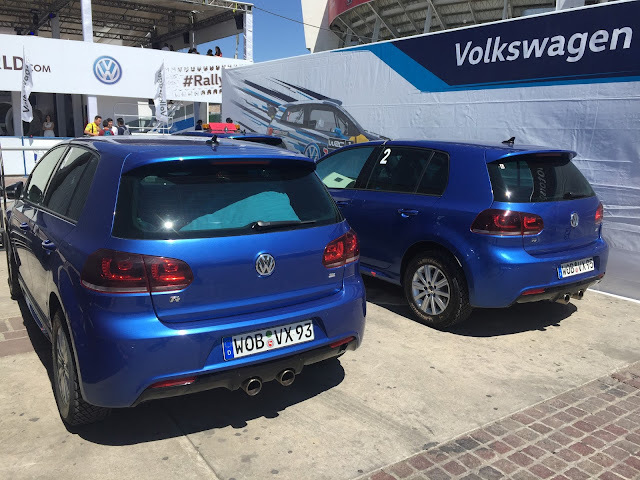 The transits have to happen in a certain predetermined amount of time and the cars have to be equipped with license plates (German in this case), headlights, taillights, wipers, etc. This is Hyundai's Belgian driver Thierry Neuville - I was present for his (and Hyundai's) first WRC win at Rally Deutschland in 2014, so it was cool to see him again, cruising down the street. Walking down the main street to Rally HQ and through the main service park, I happened upon these M-Sport WRC "recce" cars - short for reconnaissance. 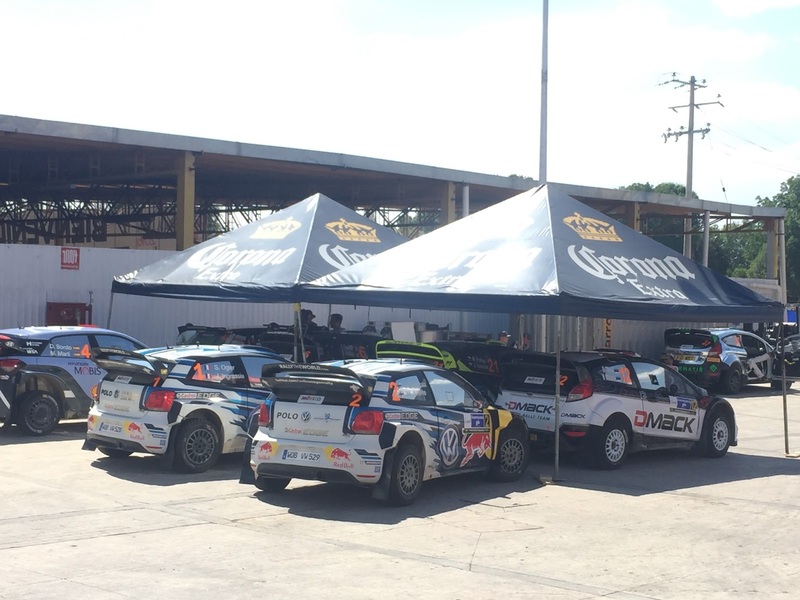 Each team has a fleet of fortified AWD street cars that are caged and setup for (comparatively) low-speed practice runs through the rally stages, while the competition cars are being prepped by mechanics. M-Sport runs Ford Fiestas, and of course Ford owned Volvo for a decade or so, hence these previous-generation S60s that looked awesome but a little out of place. Volkswagen Motorsport showed up with their own cool recce fleet in the form of these hot-rodded Golf Rs. 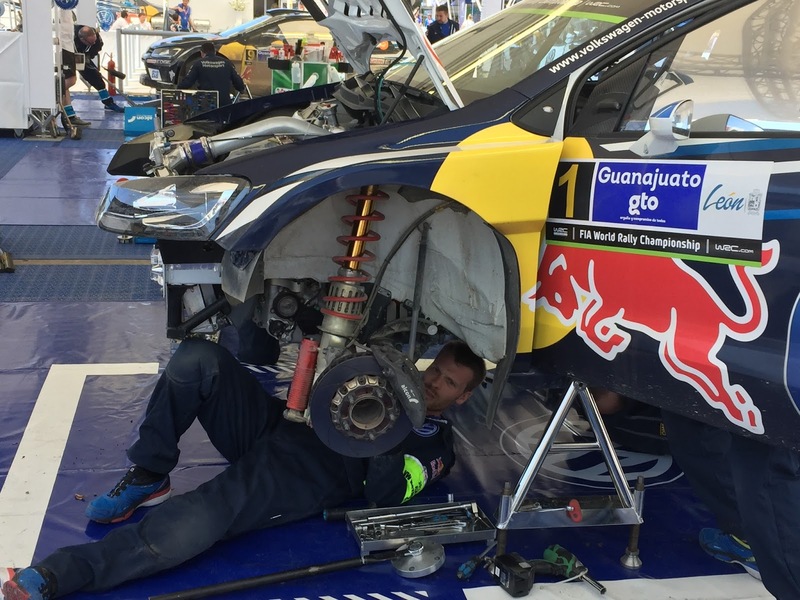 The R is AWD from the factory, yes - but WRC drivers have a tendency to "require" better equipment and thus these are equipped with active center diffs, sequential gearboxes, and other bespoke stuff that you won't find on any street-driven VW. At each corner of the car there's a dude who takes the wheel off, inspects the suspension & brakes, and starts cleaning. Each guy has his own identical toolbox with the essentials laid out neatly in a shadowbox format. This being rallying, which by definition mostly happens on some pretty rough roads, of course there will be the need to occasionally change out an oil pan, suspension link, or you know - the whole corner including the giant beefy coilover spring and damper assembly. There's a bit more activity when this type of thing happens and the frequency of terse shouts in German increases, but the mood doesn't change much - these guys are highly trained and execute with the same focused yet somehow relaxed precision every time. 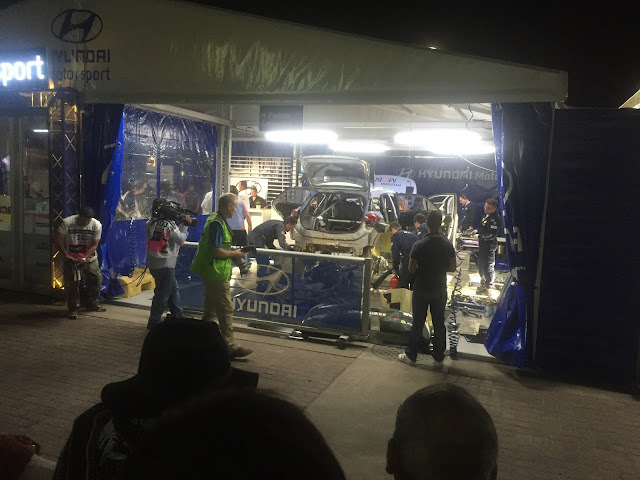 One evening I watched as Hyundai Motorsport GmbH - another German based team despite the Korean cars, names, and funding - disassembled the entire rear of one car to gain access to the fuel cell, which is protected up above the rear subframe yet had to be changed out due to a leak. This was a far more involved job than usual with multiple large pieces and assemblies getting laid out on the floor behind the car, but it was completed within the time alloted (48 minutes, or something esoteric like that) and the car looked ready to go afterward, as if nothing had happened. 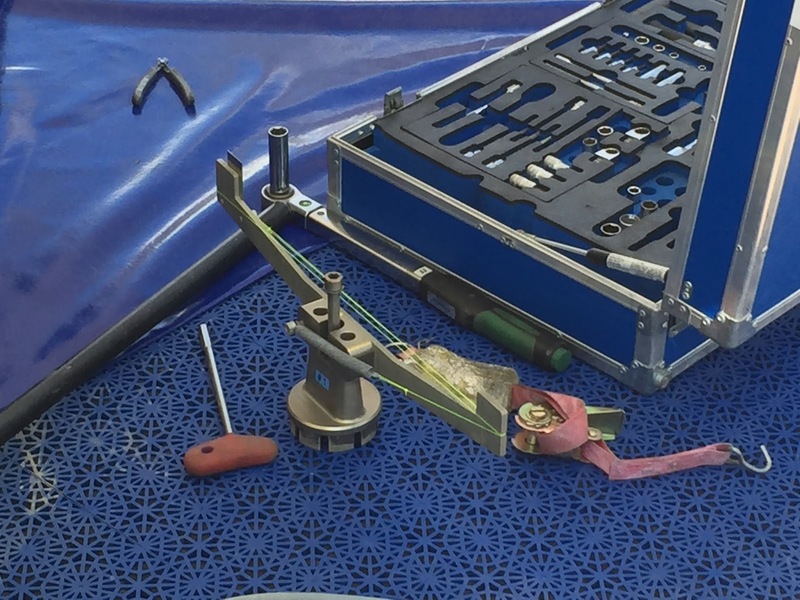 One can learn a lot by watching professional rally teams & racing teams perform pit stops and repairs - I only hope that I can incorporate some small amount of what I've seen into my own crapcan endurance racing escapades. The real action in a WRC rally or any other similar event is out on dirt roads in the middle of nowhere surrounding the service park - OK, maybe snowy ribbons of ice if you're in Scandinavia, or yeah, nice paved tarmac vineyard lanes if you're in Germany or France. At any case you have to get in your car and drive around quite a lot to see the pro drivers doing their thing at speed. 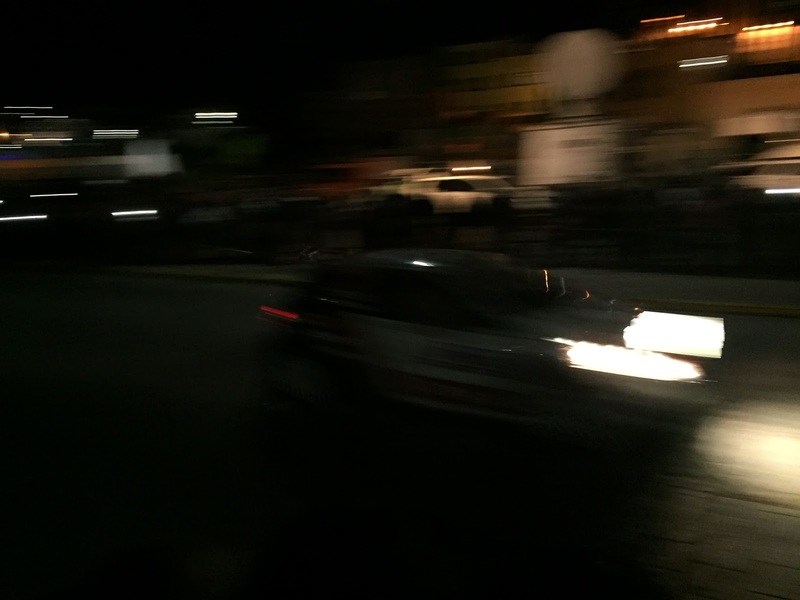 In Mexico, the opening stage is a "super special" night event, on the streets of old town Guanajato (not the state, but the eponymous colonial mining town in the mountains northeast of Léon). This place is almost medieval - it was founded in 1548, and looks like it hasn't changed much in the interim. Cobblestone streets wind through tight valleys with nary an inch to spare on either side to high unforgiving curbs. It was interesting enough driving around here at normal road speeds but downright spectacular to see the WRC cars going through at full tilt, barely missing disaster but sometimes whacking the rear quarter panel or wheel against an inconsiderate chunk of a stone building or bridge... so what if it's been there almost 500 years, that column jumped right out in front of me! Parking in a residential neighborhood in old Guanajuato and then having to convince some dubiously "official" looking hombres that we didn't in fact need to pay them to park on a public street (in Spanish of course) set the theme the next few days of stage spectating. The Autodrome stage outside of Léon was easy to find, but locals wanted money for parking in their dirt lots unless you showed your rally pass and looked like you were supposed to be there. Compared to the opening night stage which was quite difficult to photograph due to the lack of light and anything resembling bleachers, this more intimate spectator-friendly event was cake. Two cars ran at a time on separate but adjacent tracks, not quite a rallycross but the closest thing you'll see in a WRC Super Special. Volkswagen appeared to dominate, and it was fun seeing the cars up close while trying to decipher words amidst the anouncer's generously rolled rr's blasting through the PA system. The most fun and slightly terrifying part of the trip was bombing around in a rented Chevy Aveo on gravel roads up in the mountains outside of the city, looking for the end of the Agua Zarca stage in what was seemingly an unpopulated area. The occasional gated rancho house dotted the windy road, punctuated by handbrake slides and futile front-wheel-drive clawing from the puny all season tires on the Aveo. This was one of those roads that was designed for one-way traffic but was of course open to drivers traveling either way, so a sharp eye around the next blind bend was necessary to avoid catastrophe. Making it to another dirt parking lot (a vaquero's field this time), it was necessary to squeeze through a hole in a barbwire fence to get to the stage itself, but not before first paying 50 pesos to the hombre that said it was his land we wanted to pass through. He gave a little day-glo green scrap of paper as a ticket, and sure enough one of his niños was waiting halfway across the property to check credentials and ward off any freeloaders who might have tried to pass without paying. 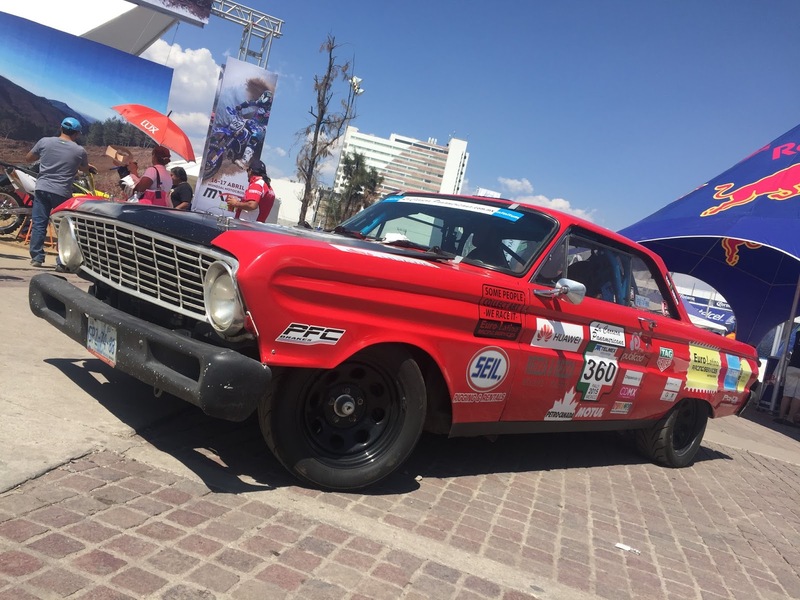 Hours of waiting around in the elements to see a few seconds of cars blasting by - yep, that's the life of a rally goer, and the Mexican fans were out in full force, playing music, having a general good time, and being pretty low key about it. If this were taking place in the rural US I imagined that a few brawls, general obnoxiousness, and some brodozer donuts would've been the norm. I was struck with how respectful and family oriented all of the Mexican fans seemed - some were barbequeing with their kids, some were flying drones, others were snoozing in what little shade was available after consuming yellow vanilla helados from a hawker. This must've been what it was like to watch a road race in the '50s or '60s; very little commercialism, and an abundance of casual fun. Jari-Matti Latvala ended up winning the rally for VW. I'll leave it up to DT readers if they are interested enough to look up official results and videos, since I was only ever aware of the current standings in a cursory sense. The way to really enjoy an event like this (after the customer meetings are over and work is done, of course) is to fully immerse yourself in the experience, have some tacos, enjoy the culture, and not stress too much about whether you know how many seconds separate first place from third. This being Daily Turismo, I would be remiss not to mention some of the more interesting street cars seen in and around Léon. There is a huge population of B13 Nissan Sentras - called the Tsuru in Mexico - which are still built locally despite being an early '90s design. 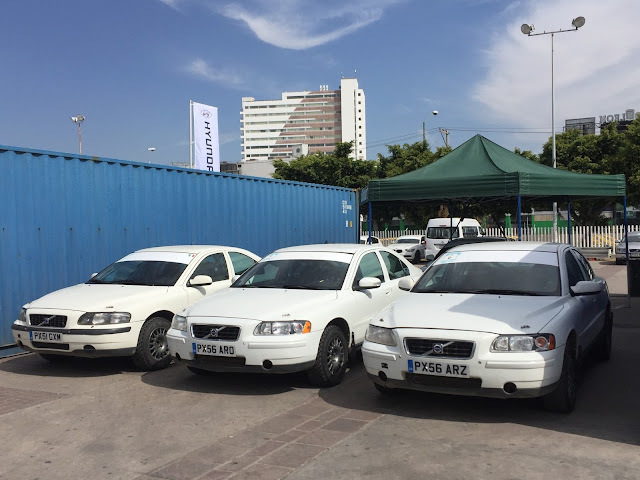 They represent about 25% of the vehicular population, mostly in the form of green & white taxi cabs. 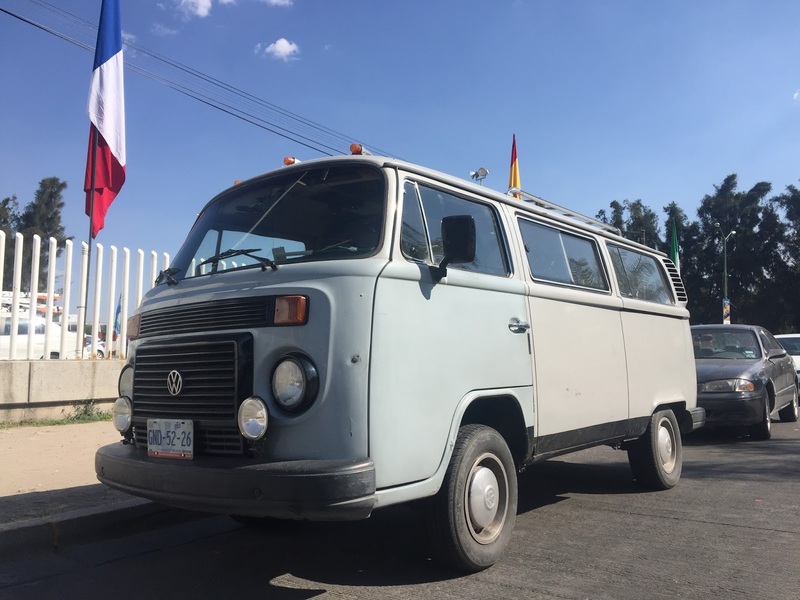 The VW Kombi (Microbus / Type 2) above was a late-model watercooled example imported from Brazil, where the 2nd generation buses were made until 2014 with an inline four shoved in the rear. This one was parked outside of Rally HQ and looked ready for some adventures in the scrub brush. 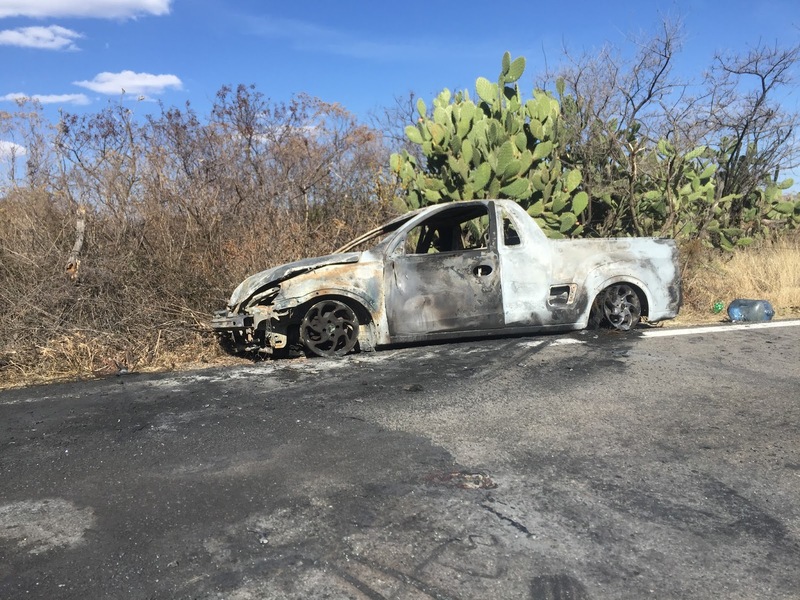 This little ute looks like it had a bit too much adventure; the smoldering carcass was hanging out by the side of a mountain highway. Who can identify the make & model? Great news everyone! 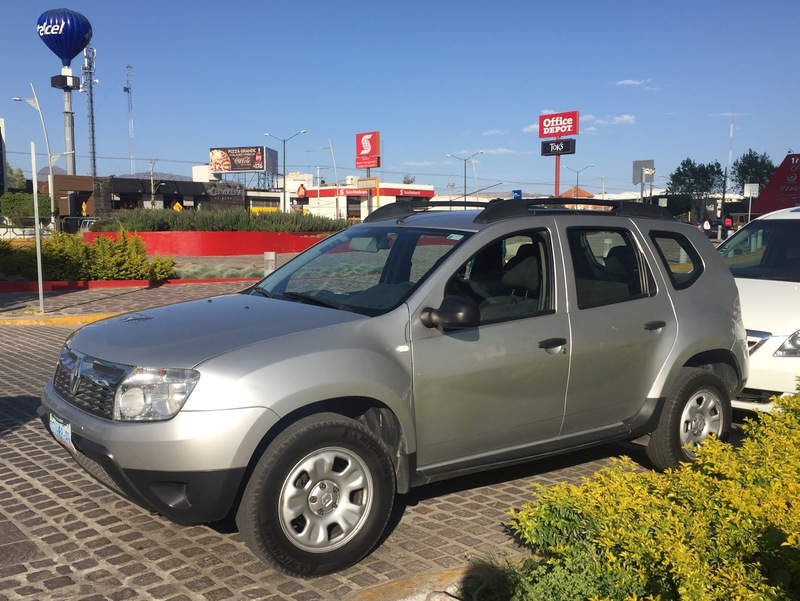 James May's favorite little SUV that could, the Dacia Duster, is now available in Mexico! Granted, it's badged and sold as a Renault there, but I'm willing to bet it's still imported from Romania. For some reason I've noticed that the cheaper the Nissan/Renault product, the better looking it is, Infiniti Q50 notwithstanding. 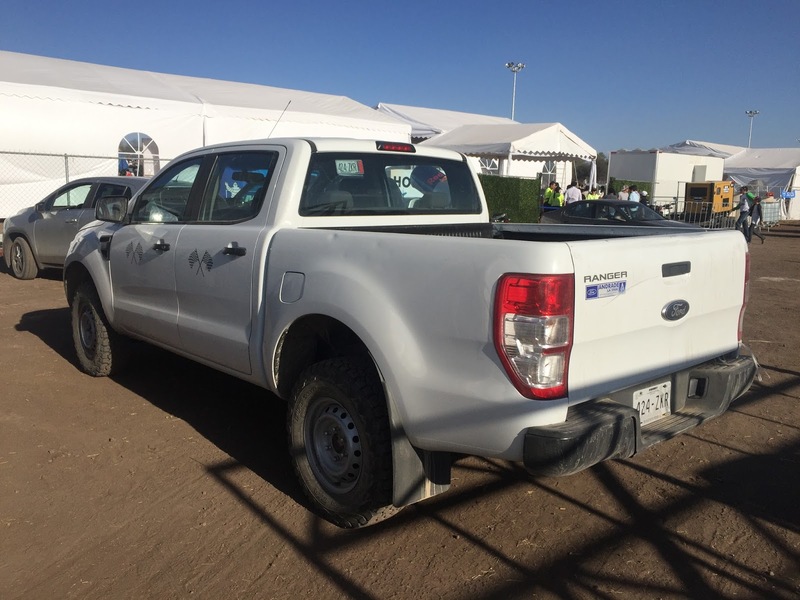 In a nice bit of irony, a great new midsize pickup truck from an American parent company is available south of the border, but not in the US. The new Ford Ranger looks to be on par with the Chevy Colorado / GMC Canyon twins in terms of size and styling. I'm a fan of the plain-jane spec with steel wheels and all terrain tires. In contrast I saw quite a few VW Amarok pickups clattering around as their TDI engines NOxified the high desert air, and wished we had more options like these in the smaller-than-fullsize pickup market. Back inside the HQ perimeter on display between the WRC team paddocks were a few oddities brought out by Red Bull, including this cool Ford Falcon rally car. Rally in this sense means a T/S/D type event like the Carrera Panamericana, methinks. There was a matching 1969 Mustang and both looked like they were built by local teams or enthusiasts judging by the Mexican flags and sponsor stickers. It's neat to see that '60s American car culture is alive and well down there in amateur motorsports. That mostly sums up the event for me - with some time to kill before heading back to the airport, I enjoyed a few of these grande cervezas for the equivalent of about $2 USD each, watching rally highlight videos on the big screens. 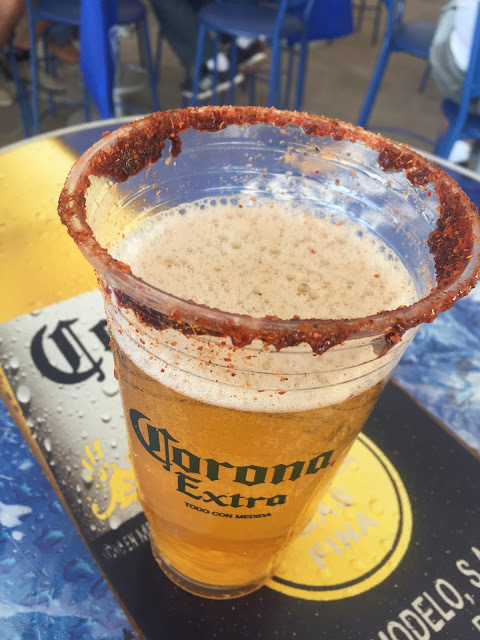 I later learned that the spicy stuff around the rim is usually composed of lemon juice, tamarindo, and chile en polvo, but regardless, it was delicious. I highly recommend checking out a WRC rally at least once if possible, to get a sense of the insane speeds that these mega talented drivers maintain on terrible roads, and to soak up modern racing technology and foreign culture simultaneously. If it happens to be deep in the heart of Mexico...bonus! This is CFlo, your humble reporter, signing off. CFlo is Daily Turismo's Co-Founder and Technical Editor. He is tolerated (but just barely) by Brazilian booth professionals around the globe. Wow, great report CFlo. We thank you for your "selfless sacrifice" in bringing us this info. Looks like a ton of low-stress fun (unlike attending something like an FIA F1 event, where you are treated like the great unwashed). I have to say, this was an excellent piece. Thanks for sharing it! The 'little ute' is more like a Subaru Brat. I saw lots of them from different manufacturers while touring Mexico in winter. This one is a Chevy Tornado, distinguished by the 'vent' in front of the rear wheel. Been meaning to post thanks for writing this up. I took my son to the Olympus Rally last year. His first stage rally as a spectator and mine since 1989. The spectator stage ambiance you describe wasn't any different than stages on Olympus: families bbq-ing, fans patiently waiting for the cars to come thru on the stage. I think you have to be a dedicated fan to go to a stage as rally is a niche of a niche of a niche sport in the US. Now days, they keep you in a spectator area and you can't go anywhere else vs. in the 80's where we used to go to the spectator stages and then walk up the stage in between cars to find different spots for pictures. Very cool. In the mountains deep in Mexico there is still lots of freedom to wander around as you'd imagine. FIA course martials & volunteers will blow whistles at you if you're in a dangerous spot and they see you there, but that's about it. When I went to Rally Deutschland, in the Mosel valley vineyards, it was the same type of deal except spectators had lots of nice hiding places between the grape vines. 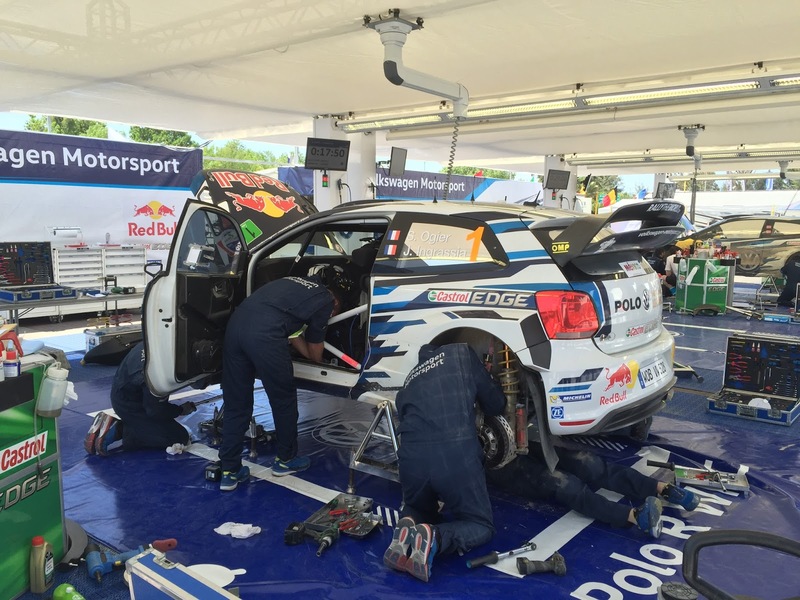 I helped one of the WRC teams' head engine guy with radar speed datalogging for each car that came through the stage. Fun stuff. More clouds than Mexico, and more wine.